When the service life of a product containing precious metals reaches its end, recycling offers a way to recover and reuse those precious metals. Since recycling companies and manufacturing companies working in isolation can only perform one of two process, recycling or manufacturing, they have no choice but to buy or sell their precious metals through the market, or at least after having the precious metals mechanically processed into a form they can handle. For recyclers, this incurs an extra cost for going through the market (the spread: the difference between the selling and buying prices), while for manufacturers, this creates extra lead time as a result of distribution. In contrast, the TANAKA Kikinzoku Group offers a fully integrated, one-stop service. We do everything from bullion procurement to material processing, manufacturing, sale, and recycling—all without trading in the market. This provides our customers with shorter lead times and a reduced cost of procuring bullion. We also offer an extensive line of products. For example, we can recover precious metals from spent electroplating solutions, recycle them into gold wire, and deliver it right to your door. By combining three key aspects of a successful precious metals recycling operation—assaying capabilities, recycling and fabrication processes, and product diversity—we are able to realize cost savings no other company can, providing the ultimate recycling solution. The key to effective precious metals recycling is the ability to determine how much of a precious metal a substance contains. Differences in assaying capabilities thus have a direct impact on customer costs, because these capabilities determine how much metal can be extracted in recycling. 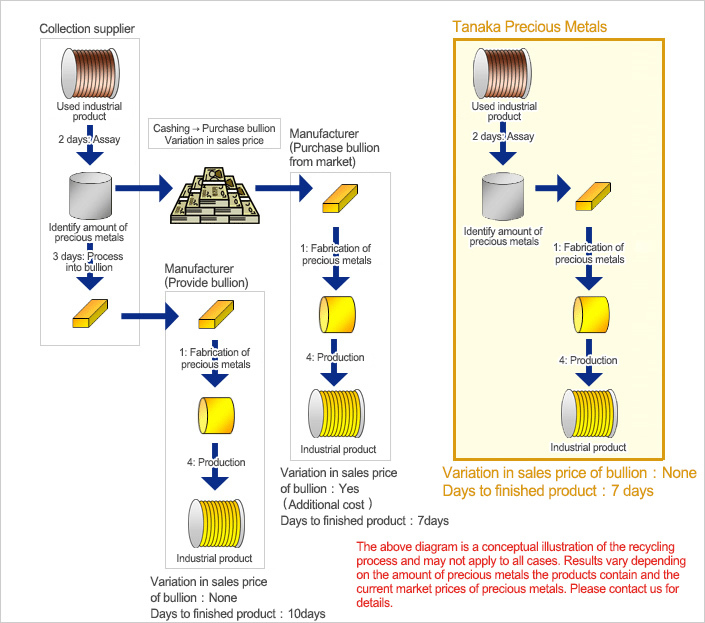 As one measure of our assaying capabilities, the TANAKA Kikinzoku Group is one of only five companies worldwide, and the only company in Asia, to be accredited as a Good Delivery Referee by both the LBMA and LPPM, the most authoritative market-monitoring organizations worldwide. We were also the first company in Japan to acquire ISO/IEC 17025 accreditation for our platinum, gold, silver, and palladium assay competence. Costly precious metals deliver their full value only through effective use. The TANAKA Kikinzoku Group recycles end-of-life industrial products as well as waste scraps and splashed waste in equipment generated during the manufacturing process, with our extensive experience providing customers unrivalled cost benefits.